Drizzle dampened the docks, the air was cool and skies were gray. 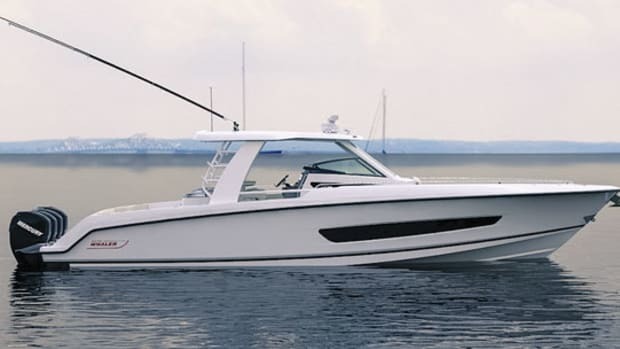 By most accounts it was a bad day to kick off the Annapolis Powerboat Show. These days have a hidden benefit, however: They separate the serious boaters from the tire kickers. 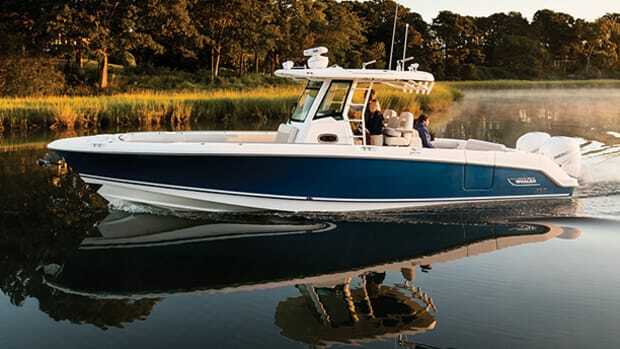 If you were on the docks this morning you were highly interested in seeing some new models. 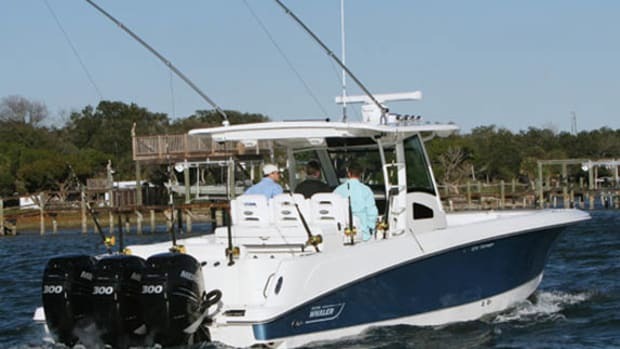 It was interesting to watch flocks of serious buyers gravitate to the new Boston Whaler 380 Outrage. Intended to handle much worse elements than a little drizzle, the aft sunshade was deployed and kept showgoers dry while they inspected the feature-rich cockpit. 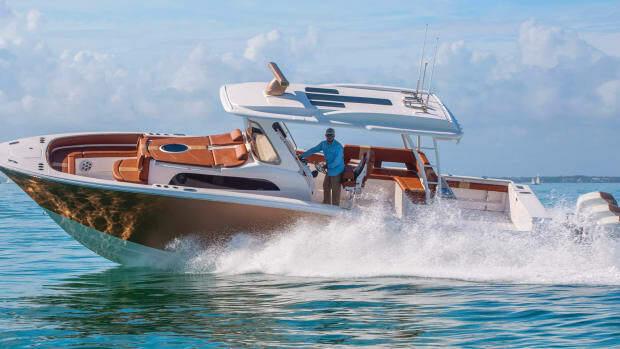 From aft-facing seating that converts to a table for making lunches—or prepping baits—to the 60-gallon livewell, fold-down gunwale seating, and slide-out drawer that fits a bucket, this boat was clearly designed by active boaters. This small touch—the space that locks a bucket in place, out of the way—reminded me of fishing trips where we left a bucket filled with thawing bait in the cockpit only to have it slosh all around. Or how I’d try to stash a bucket of soapy water in a cockpit for a mid-cruise wash-down only to have it fall over and spill everywhere. It was a detail that was simple and satisfying. 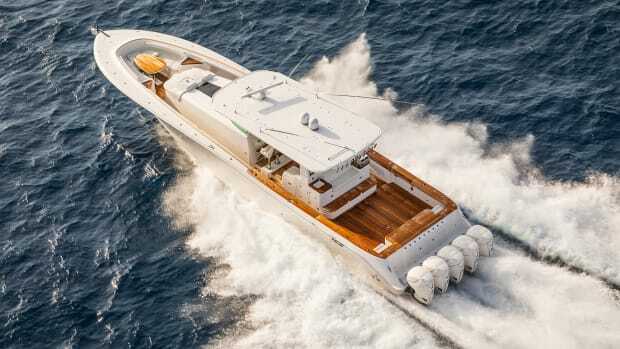 The wow factor on the 380 for many, myself included, was the heat and air conditioning at the helm. 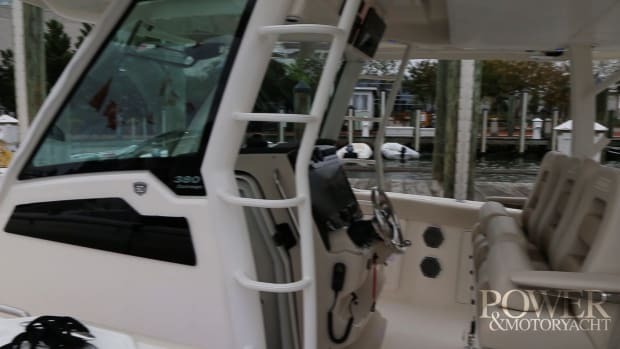 I’ll let that sink in for a minute… Yes, the helm of a center console has a heating/air conditioning system with vents right behind the helm seats. Certainly serious fishermen that leave and return to the dock in the dark hours of the day would appreciate a break from the brisk bite of the air. Speaking of the helm, I could tell from the dock that forward visibility would be good, even when coming onto plane. 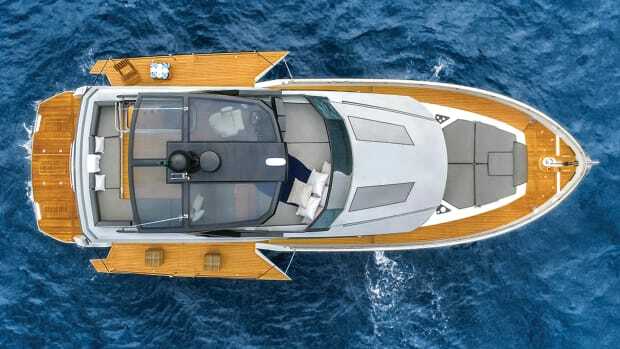 But what makes that visibility go from good to great is a fold-down platform that raises you 3 inches off the deck when standing at the helm. It’s a cool touch that I think would help children and adults alike better see what’s coming over the horizon. Children—that reminds me. 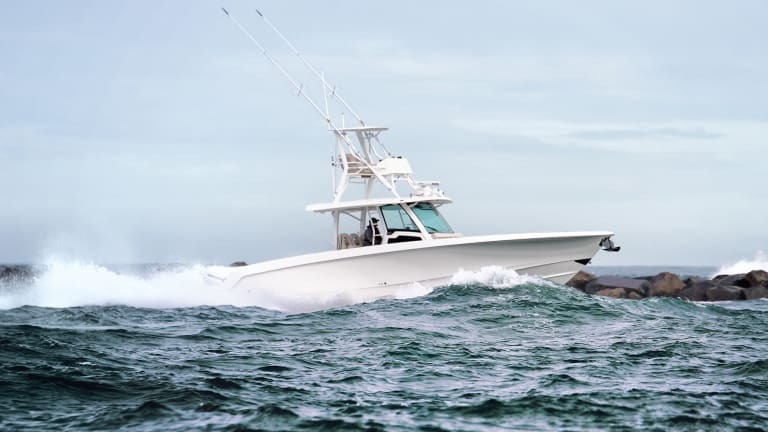 Boston Whaler’s design team must know that the way to the hearts of today’s young people is through a fully charged smartphone. There are USB ports everywhere, from the helm to the armrest in the forward sunpad. 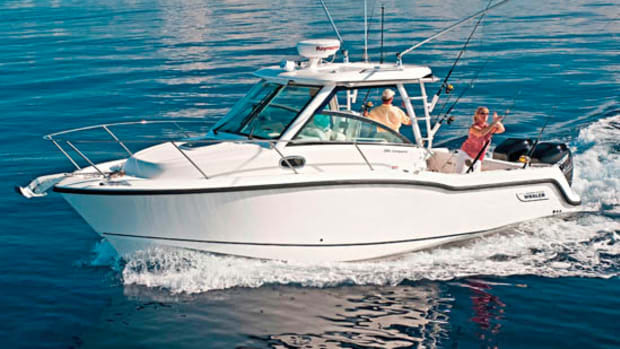 Maintaining your kids’ interest in boating is something we can all agree is #awesome. 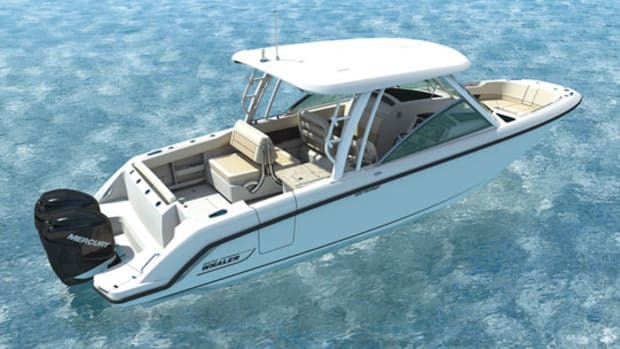 Belowdecks is a double berth, head, and galley; good for an overnighter or two. One thing I really liked in there was the rod stowage along the bulkhead. 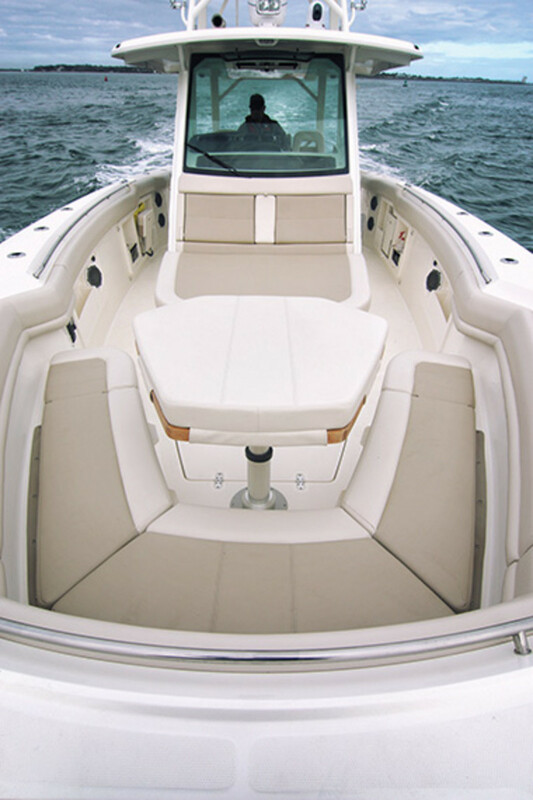 I learned that most Whaler owners keep their rods atop their coolers and bags in the stowage locker beneath the forward sunpad. That’s all well and good until, well, you need to get to the cooler or your bag, and then you have to pull out all your rods and reels. Moving that stowage below just make sense. There’s even an accent light that turns your reels into a work of art. Fine art and new reels are comparable in price, after all. 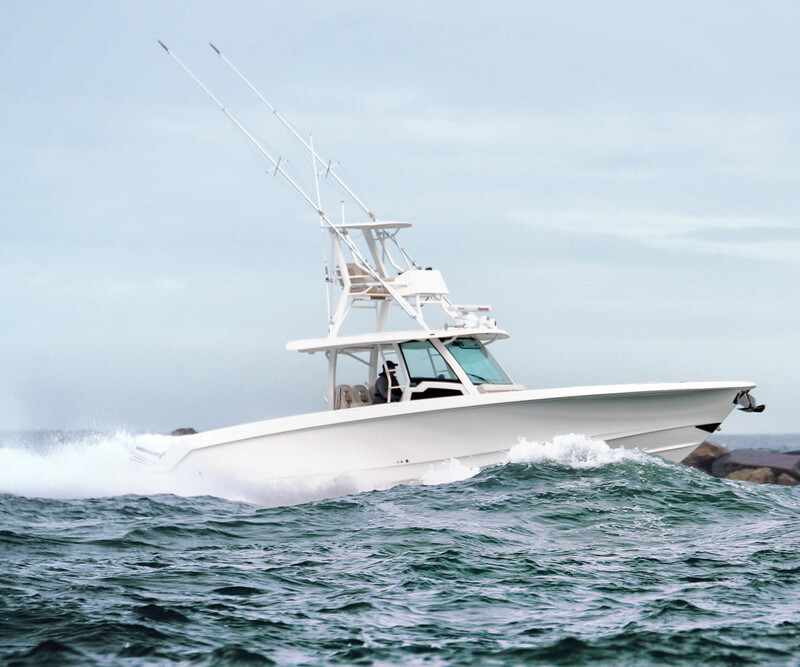 These brag-worthy features, when combined with the performance and seakeeping that has allowed Whaler to not just survive but thrive for 60 years, make the 380 Outrage a very popular model, even on a rainy day.